Geraftaar is not just a simple tale of two brothers separated at birth as this film manages to incorporate almost every Hindi film cliché. There is the long suffering mother, a significant song, brothers and sisters, fathers and sons, a significant necklace and to top it all off death by bulldozer. As if that wasn’t enough we have not one, not two, but three heroes. Kamal Hassan, Amitabh Bachchan and Rajnikanth appear together although unfortunately not all on screen at the same time. Karan Kumar Khanna is a brat of a child, but still doesn’t deserve to be framed for his father’s murder. Adding to his misery, the real killers convince him that he may have been responsible. Nirupa Roy, in true filmi Ma style, instantly believes that he did indeed kill his father. Karan runs away and tries to kill himself. This allows his brother Kishan to grow up free from his teasing at least. Kishan grows up into Kamal Hassan. Working as a stuntman in the film industry he has big dreams of making it as a hero but struggles to get paid the basic rate for his work. His personal life is no more successful. After a rather unpromising start, he finally marries the unbelievably spoilt and self-centred Anuradha. 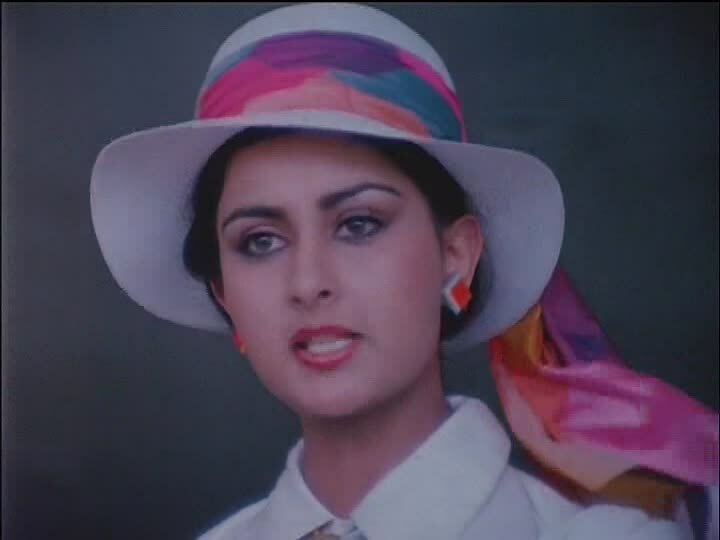 Anu is played by Poonam Dhillon, who does a very good job of making her character initially unappealing. Back to those clichés! Anu’s brother is a gangster and is involved with a number of shady businessmen, who were also responsible for the death of our heroes’ father. They devise a plot to frame Kishan for the murder of his dancer friend Lucy, (but unfortunately not before she does a really bad version of flashdance), and he ends up in jail. Coincidence rules and thanks to that significant song he manages to find Karan, although he doesn’t know who Karan is. 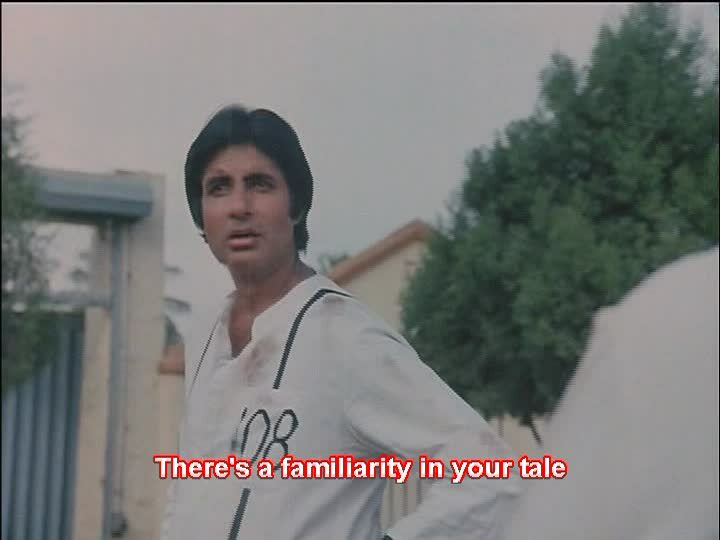 Karan (now the much taller and much more serious Amitabh Bachchan) explains why he is in prison though a series of flashbacks that pick up from his failed suicide attempt. We learn that he was found by a Muslim boy, and taken in by him and his mother. Both boys grew up to be police inspectors, but Hussein (Rajnikanth) was killed by Vijay, the police commissioner’s son. Karan is in love with Vijay’s sister Geeta, played by Madhavi in a role that involves quite a bit of fisticuffs! So we have a symmetrical arrangement of two good(ish) girls who both have evil brothers plotting against our heroes who are long-lost-brothers. There are various jail breaks, song breaks, court dramas, deaths by bulldozer (yes, more than one) and the inevitable family reunion, so that all ends well. There are some great things about this film. Inspector Geeta gets to join in for a lot of the fight scenes and does a really good job. 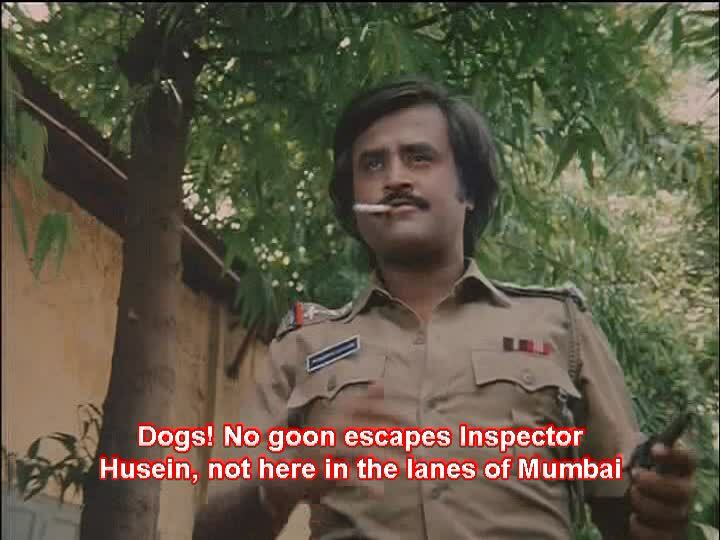 Rajnikanth is excellent as the cigarette tossing Inspector Hussein and manages a suitably dramatic and filmi ending – defiantly smoking his cigarette to the bitter end. The gang are the comedy relief and manage some funny moments in their convoluted plans. 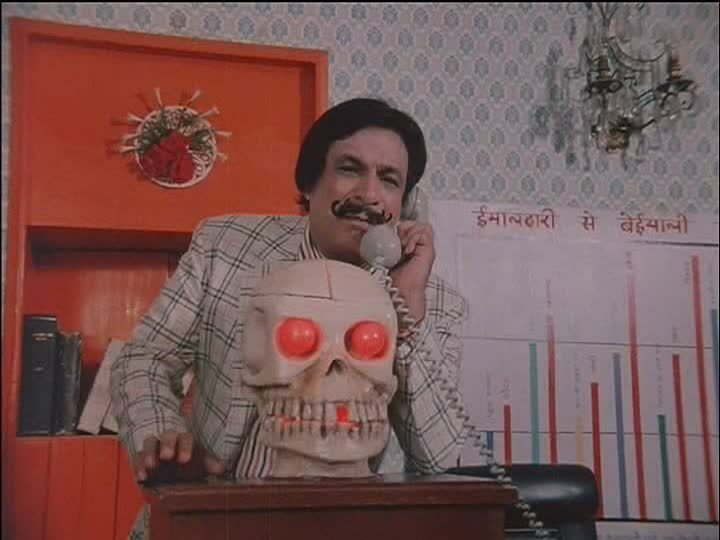 Kader Khan has a really insane moustache, and is clearly the head villain as he has a talking skull that gives him advice! The scenes of Karan and Kishan singing and wandering around what appears to be a very nice open-plan prison are well done and the drama of their meeting is well handled. The character of Anu is initially unlikeable and shows no empathy for anyone. She tricks Kishan into believing she loves him (and his Ma) and then humiliates him in front of her friends — all because she couldn’t stand the idea that he wasn’t interested in her. In revenge, he insists on marrying her before sending Anu back to her brother’s house so she can be trained to be a worthy bride. This deception on both sides leaves Kishan’s Ma in hospital as she crumbles under the weight of so much bizarre behaviour. Anu has an epiphany and magically morphs into the perfect wife, praying to die before Kishan and wait for him in the afterlife. Neither of the female leads show any regret about their brothers – either for the life they lead or when they both suffer the consequences for their wrong-doing. Geeta initially tries to reason with her brother Vijay, but doesn’t seem at all happy to find that reports of his death were premature. Anu is shown vowing to cast aside her other relationships and accept Kishan as her husband but that was part of her deception so it wasn’t clear if she decided a vow was a vow, or if some other change of heart took place. The rest of the film is dedicated to family so this lack of feeling from the sisters towards their respective brothers did seem odd. Kamal Hassan turns in a very good performance as Kishan but is upstaged by Amitabh in the second half. The two heroines do what they do, but don’t really have much to work with although they both get to participate in the action in the final scenes. Nirupa Roy with her trademark knuckle bite is once again the dramatic filmi mother. The music by Bappi Lahiri leans heavily towards disco – this was filmed in 1985 – but the significant song Aana Jaana Laga Rahega is lovely and sung beautifully by Shabbir Kumar and Bappi Lahiri himself. Kader Khan, Ranjeet and Shakti Kapoor play their usual stock characters and once again reap the benefit of a well funded wardrobe department. The fight scenes are very amusing. Although sped up to a ridiculous degree they still look quite leisurely. Perhaps the fights composer, credited as Judo Rathnam, was really a tai chi expert. Heather says: I started this film a few times before I finally managed to watch it to the end. I find the first half drags, and the character of Anu was so annoying that I ended up shouting at the screen. But the whole tempo of the film changed at the appearance of Amitabh and Rajnikanth, so it was well worth making it to the second half – thank-you Temple for insisting I finish it! Rajni steals every scene he is in. Despite the fact that this is a special appearance with only a small role, he made the most of every second and I loved every single one of them! Amitabh was overly dramatic which made him somewhat more comic than I think was intended, but seemed to fit the general feel of the film. I couldn’t really take death by bulldozer seriously and spent most of the film laughing at the melodrama of it all. When I wasn’t getting annoyed by Anu at any rate. I enjoyed the songs and thought that the comedy track was well written in, and had some very funny moments. I have the feeling they couldn’t decide if this was meant to be a drama, a comedy or an action film, but instead of adding everything to make it full masala it just ended up switching from one style to the other and was just that little bit less satisfying. That little bit of Rajni helped make it more palatable. This film gets 3 stars from me. Temple says: I agree with Heather that the director couldn’t quite decide how to spread out the masala ingredients in Geraftaar—so I think they decided Kamal Hassan got the comedy (mostly), Amitabh took drama and Rajnikanth was the action man. Which made for an uneven, albeit wildly entertaining, film. Bulldozers are not a weapon for the spontaneous killer, so the build up to get to the death by moving equipment was overly complicated and really made the film drag. And how some of the victims didn’t see it coming is just beyond me. The three heroes did an excellent job, especially Amitabh and Rajni as their roles had more substance and, I can’t believe I am going to use this word in relation to this film, logic. The heroines were OK for their under-written and sketchy roles and Madhavi looked like she was right into the biffo in the final scenes. 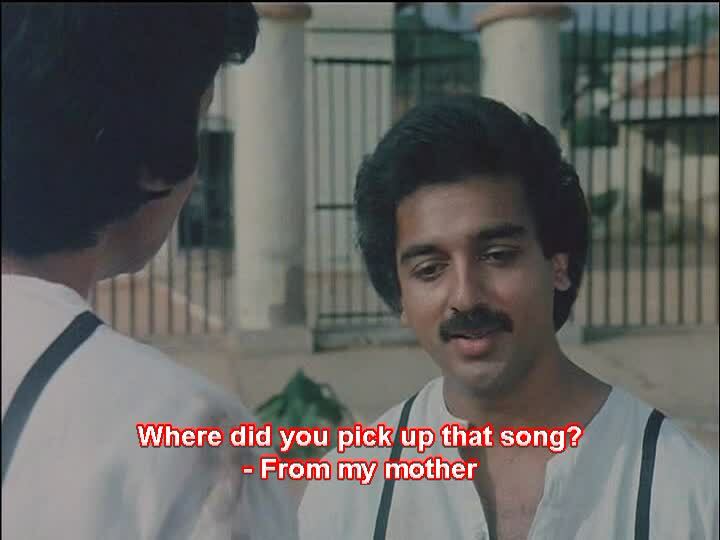 I do have to give an extra cheer for Kamal Hassan’s dancing duel in his featured song. Its worth seeing Geraftaar just for the star cast. It’s a bit of a chore to hang in there til the action kicks in, but it is worth it. I give this 3 and 1/2 stars. It gets extra for the skull with glowing eyes and for Kamal Hassan’s dancing. This entry was posted in Bollywood and tagged Amitabh Bachchan, Bappi Lahiri, Bollywood, Geraftaar, Hindi, Kader Khan, Kader Khan's Moustache, Kamal Hassan, Madhavi, Nirupa Roy, Poonam Dhillon, Prayag Raj, Rajni, Rajnikanth, Ranjeet, Shakti Kapoor. Bookmark the permalink. GIRLS don’t have the same amount of feeling for their family as boys, duh! The only family they’re supposed to really care about is the one into which they marry. How little you understand the intricacies of proper Indian womanhood! You know, I always forget that Kamal was originally famous for his dance moves. I know….we’re just beginners. But we did spot the ‘sari moment’ when Anu became a good Indian wife. Hmmm. I have looked at this and always put it down again. Sounds like I should just leave it. How did the panel go? Hope you had fun! Well, if the idea of Kamal Hassan, Amitabh, Madhavi and Poonam Dhillon each driving their own Bulldozer of Doom in pursuit of the bad guys doesn’t inspire you, then this film is probably not for you. I totally want to see this! I loved that fight scene you included – such great use of furniture and FF/rewind work! – and I like the idea of a do-something female officer and younger, rock-em sock-em Rajni. Heck, you had me at the glowing skull that gives advice. Re: the sisters – I would take their lack of attachment to their evil brothers as signs of their innate goodness (though of course defer to Amrita on this point). 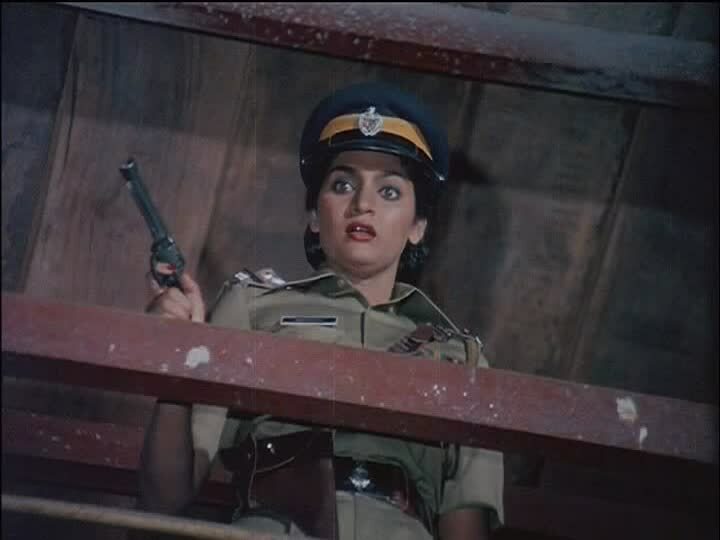 I’m trying to remember filmi sisters of bad brothers…Parveen eschews Vinod in Chor Sipahee until he redeems himself, but that’s the only one I can remember.